In this tutorial, it is assumed that you have followed the steps described in Tutorial 1, i.e. 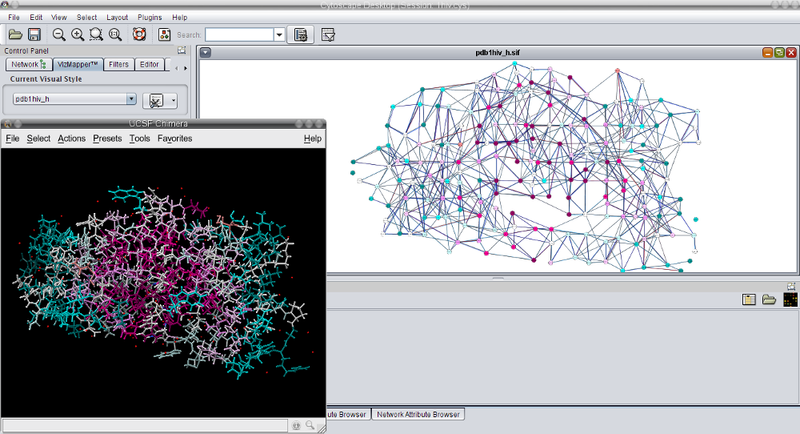 the Cytoscape session pdb1hiv_h.cys is opened and the corresponding 3D structure is loaded in Chimera. Go to our RIN data download page. Enter the PDB identifier 1hiv in the search form (image ) and click the Search for RIN data button. 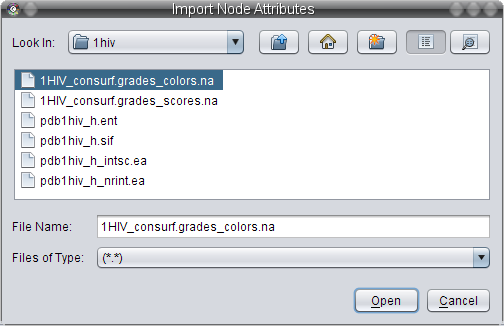 Besides the RIN data for 1hiv, you can download two node attribute files with residue conservation data (image ). 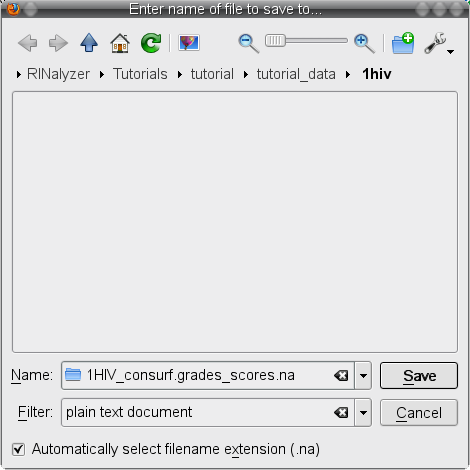 Click on the first link (image ) and save the file to your local file system (image ) under the name 1HIV_consurf.grades_scores.na (image ). 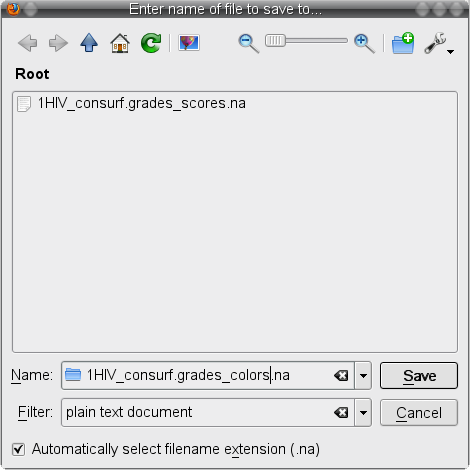 Click on the second link (image ) and save the file to your local file system (image ) under the name 1HIV_consurf.grades_colors.na (image ). 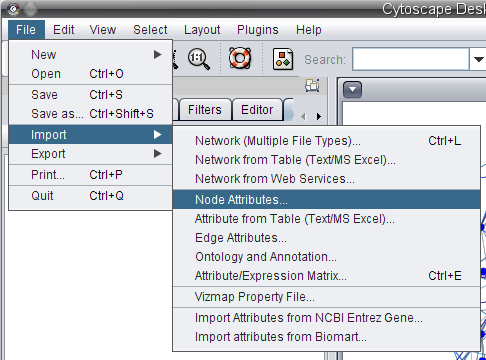 Select the node attribute file in the file browser and click on the Open button (image ). 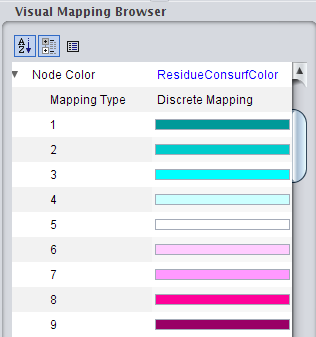 Go to the Node Color row (image ), click on the right field to change the attribute to ResidueConsurfColor (image ) and change the mapping type to Discrete Mapping (image ). 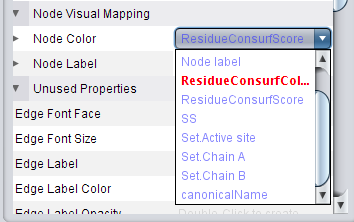 The ConSurf-DB color scale uses 9 values to represent the conservation scores (9 - conserved, 1 - variable). 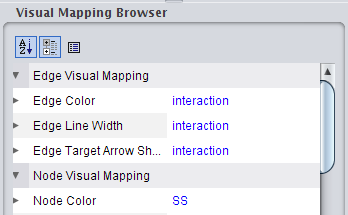 Therefore, there are 9 rows with values to be mapped to colors (image ). 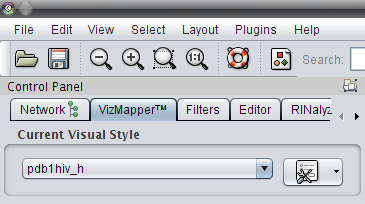 You can set color for each value by clicking on the right field in the row (image ) and then on the ... button. Set the colors as in this image . 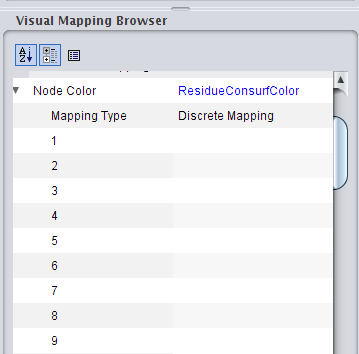 Color residues in Chimera according to the node colors in the network view. 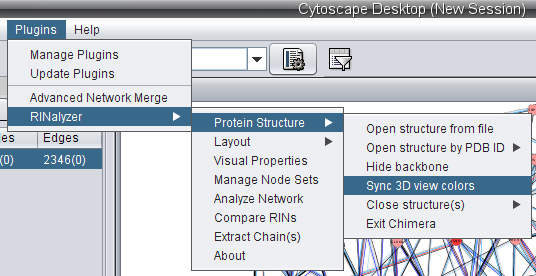 Go to Plugins → RINalyzer → Protein Structure → Sync 3D view colors (image ). The network and the 3D structure should look as in this image .